At the beginning of this month, Ted McMeekin, the Ontario Minister of Community and Social Services, informed the provincial Legislature that his government will not be merging Ontario Works (OW) with the Ontario Disability Support Program (ODSP). Given that the Liberal’s own 2012 Report of the Commission for the Review of Social Assistance in Ontario calls for such a merger, this belated statement of intentions is quite significant. “I have heard from many people who are concerned about the possibility of Ontario Works and ODSP being merged into one program. In some cases, they’re responding to irresponsible rumours that our plan is focussed on cuts – bringing everyone down to the lowest common denominator and forcing everybody to look for work, regardless of their disability. The rather testy comment about “unfounded rumours” is clearly a reference to what the Ontario Coalition Against Poverty (OCAP) and others in the Raise the Rates Campaign have been saying. For months now, we have been demanding that the Kathleen Wynne Government publicly state that it will not merge OW with ODSP. That the Liberals have taken so long to take this position and distance themselves from the proposal of their own report is likely evidence of an internal debate within the Liberal Cabinet. They have faced relentless community based opposition on this issue. 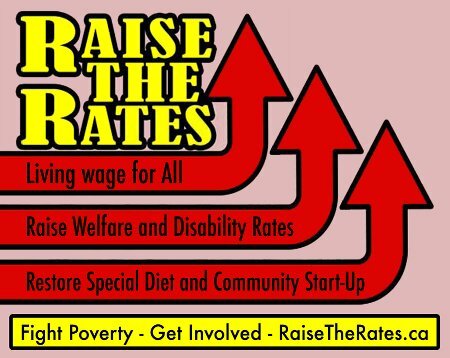 As recently as March 22, anti poverty organizations joined with trade union allies from CUPE Ontario and OPSEU to march, under the banner of the Raise the Rates Campaign, on the Liberal AGM in Toronto. Kathleen Wynne had to defend her shaky credentials as the ‘Social Justice Premier’ behind a line of cops. It is a very significant gain for community action that McMeekin had to make this announcement. I have no doubt that the opposition to the merger that developed and the prospects of a major mobilization if such a step had been taken, was decisive in prompting this tactical retreat. It shows us that the architects of austerity are not invincible and that we can defeat their plans if we fight back. Having said this, however, we would be making a huge mistake if we assumed that the danger to ODSP has passed. The Liberals did come under great pressure over the proposed merger but they also had their options reduced by virtue of the fact that they are a scandal plagued minority regime that must soon present a Budget. Precisely because their political future is so tenuous, McMeekin’s pledge is devalued significantly. A Tory Government would not be bound by his statement and it’s not even certain that the Liberals themselves, should they prevent or survive an election, would rule out putting the merger back on the table. Even more to the point, however, a joining together of the two programs is not necessarily the form that an attack on ODSP might take. An austerity driven government like that of Kathleen Wynne, could move in thoroughly regressive directions while retaining two distinct programs. Before exploring this further, however, let’s look at how such an attack fits into the prevailing austerity agenda. During the period they have held office in Ontario, the Liberals have continued with that part of the Mike Harris Conservative Government’s 1990s Common Sense Revolution that sought to undermine income support systems. They have allowed the spending power of social assistance to erode further and have removed or weakened supplementary benefits that people turned to in an effort to compensate for their loss of real income. This has only to a secondary extent been about saving money or reducing deficits. Its main purpose has been to intensify the scramble for the lowest paying and most exploitative jobs. Since the Liberals took over in 2003, the number working for the minimum wage has doubled in Ontario and now comprises 9 per cent of the workforce. Had social assistance rates been restored to pre-Harris levels, this could never have been accomplished. Now, in the context of post-2008 international agenda of hyper-austerity, the dictates this places upon the Government of Ontario is to take this process further. In this regard, the relative adequacy and stability of ODSP is seen as a barrier to be removed. Several political jurisdictions are contributing to the attack on disability benefits but it is the Conservative-led David Cameron government in Britain that has led the pack. The reckless and brutal process of social abandonment that it has inflicted on sick and disabled people in that country has shocked observers across the world. Cameron’s Coalition privatized and intensified a measure known as the Work Capability Assessment (WCA) in a way that has led to rampant denial of benefits to even the profoundly disabled and the terminally ill. More than 10,000 people a year in the UK have died since being deemed ‘fit for work’ by the assessment system, and another 2200 before their assessments were completed. The model created by the UK Government’s Department for Work and Pensions and its private enforcers, particularly the infamous Atos company, is there for the Ontario Government to aspire to. It already has the experience of implementing very similar measures in its attack on injured workers in this province. The widespread practice of ‘deeming’ that has been adopted by the Workers Safety and Insurance Board (WSIB) is not that far from what is happening in the UK. Injured workers are being declared ready for forms of employment they have no chance of securing or maintaining and are losing their benefits in a fashion that would get high marks in the British House of Commons. In February of this year, there were 439,553 beneficiaries receiving ODSP in Ontario, only slightly short of the 450,552 on Ontario Works. Perhaps the most important task facing the regressive ‘reform’ initiative that is underway is to massively reduce the numbers on ODSP. Of course, ODSP caseloads have increased precisely because injured workers are being hounded off benefits and other income support options are being squeezed but this does not remove the austerity based imperative to slash these numbers. While Frances Lankin and Munir Sheikh, who wrote the report for the Commission for the Review of Social Assistance in Ontario, have not been taken up on their merger proposal, it would be wrong to assume that they are merely crying in the wilderness. They propose a redesign of social assistance in which everyone on it, including the disabled, are assessed by the yardstick of employability. Under their model, employers’ councils would be set up to assist in the building of “pathways to employment.” What jobs are actually available, what they pay and what happens to those who fail to keep them are not considerations that are given any particular attention. What is important to Lankin and Sheikh is that the ‘integrity’ of the system of providing sub-poverty payments to disabled people must be protected at all costs. They suggest that there is a backlog of 40,000 cases on ODSP that need to have their eligibility reconsidered, that this should be cleared up and a far more vigorous review process put in place. A more clearly set out blueprint for moving in the direction of the UK Government could not be drawn up. As I’m writing, I learn that Ontario Works employment programs in at least one part of Ontario are being told to be ready to start receiving ODSP clients soon, and that they will deal with them the same way they presently deal with the spouses and dependents of people on ODSP. It confirms that McMeekin’s Ministry understands very well the measures it needs to take to move toward the prevailing austerity based model of ‘reforming’ disability benefits. The New Zealand Government of John Key, which has adopted many of the measures being implemented in Britain has described its own regressive ‘welfare reform’ process as being based on an “unrelenting focus on work.” That phrase rather sums it all up. There is no focus, of course, on ensuring living wages or providing the actual supports people need to be able to sustain employment. Rather, the intention is to use abandonment and the threat of destitution as a means of creating a desperate bidding war for a place in the low wage ghetto. The disabled will not be exempt from this process. On the contrary, their participation in the scramble is considered vital to the plot. We must understand the nature of the attack precisely because we intend to defeat it. In the UK, the assessment system that has brought such misery into peoples’ lives has been challenged relentlessly and the model of regressive reform is floundering as a result of that resistance. The Raise the Rates Campaign, initiated by OCAP, backed by anti poverty organizations in a range of communities and supported decisively by CUPE Ontario and other unions, has shown that we don’t have to accept austerity as an inevitability: we can impose defeats on those who seek to implement it.